Fred Stites of Kent County, Delaware had the state’s top 2018 yield in the Delaware Soybean Board's Yield Contest with 78.81 bushels per acre of full season soybeans. Rick Davis, Cory Atkins and Fred Stites are pictured during Agronomy Day at Delaware Ag Week in Harrington, Del. 2018 was a challenging year with the weather and the decreased yields reflected it. We encourage growers to participate in the contest to make more production data available for farmers to use in planning next season. 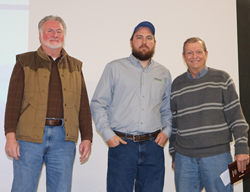 The contest was created by the Delaware Soybean Board to gather data on practices incorporated in producing high soybean yields while recognizing the individuals who have achieved such yields. The goal is for the information gathered in the contest to help increase yields for all farmers across the state. Full contest information and results summary can be found on the DSB website. The Delaware Soybean Board is funded by the national soybean checkoff program, which assesses one-half of one percent of the net market value of soybeans at the first point of sale. The Board consists of nine farmer-directors and the Secretary of Agriculture, and administers the federal soybean checkoff programs in Delaware supporting research, marketing and education programs to benefit the soybean industry. The Delaware Soybean Board is funded by the national soybean checkoff program, which assesses one-half of one percent of the net market value of soybeans at the first point of sale.